In this PWA post I will cover the Cache API and the storage limitations of the Cache and IndexedDB APIs, how you can use a Manifest file to support touch icons and the 'add to homescreen' functionality and the Lighthouse audit tool. A cache is technically a request-to-response map, where we store request URLs and their responses in the cache. This allows us to serve data from the cache initially, or intercept network requests and serve directly from the cache where possible. There are a number of methods in the Cache API, however I will not be covering them in this post. Mapping our cache actions to Service Worker events will help us to understand how to incorporate caching into service workers and allow you to build upon your service workers easily. 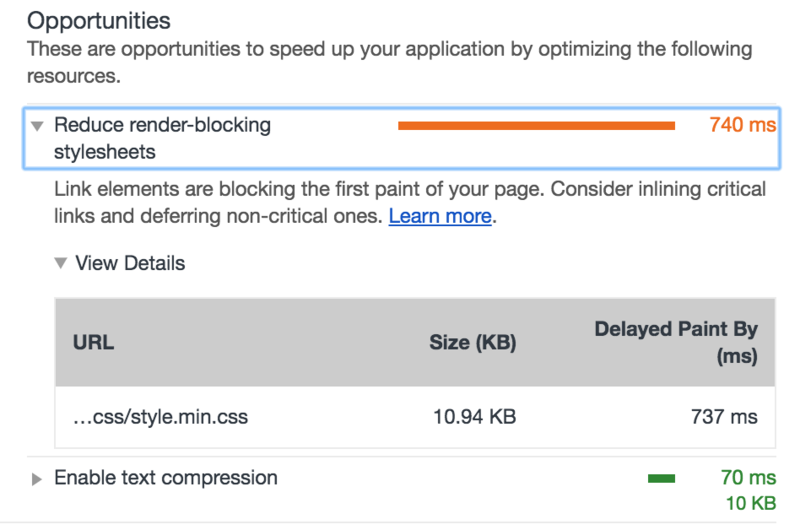 There are a number of common caching strategies such as the Cache with Network fallback you have seen in a previous PWA post. This strategy focuses on caching on network response, other strategies focus on caching on installation or on user interaction. Note: You should have a service worker setup prior to continuing. Instructions to set-up a basic service worker and how to implement it on your page can be found on my GitHub Gist. Caching on install happens in almost every service worker, because we almost always cache some static assets. For instance a website header image, the CSS file etc. This particular caching stategy extends to webapps in a specific way, caching your application shell! By caching our application shell we stop the user from having to redownload the static parts of a web application, meaning that they only use data for the dynamic parts of the application. The code example for this can be found on my GitHub Gist. 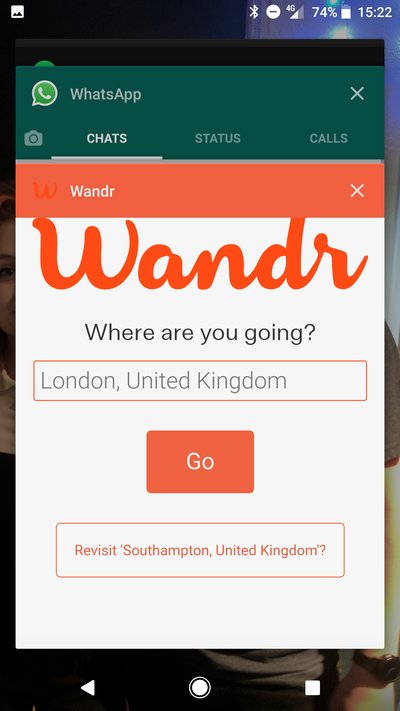 Caching on user interaction is very useful for a lot of user journeys, for instance a blog that does not fully-support an offline experience could make use of this strategy by allowing users to "Save for Later". Triggering this action would then put a copy of an article/post in the cache, allowing the user to visit that post at their leisure e.g. while on the train home from work, while offline. Using the code example above you should be able to implement Cache on User Interaction with ease, the only real changes needed are configuration-related for your website e.g. DOM structure and fetch URL + parameters. You will also need to adjust your fetch event listener in the service worker to check for article caches. Due to Progressive Web Application's being a rather young technology, the specifications for these young APIs aren't quite as unified across browsers as you would expect and therefore implementation details vary slightly. To clarify: there is no change in behaviour across browsers. It is very common for these storage limitation to be across the various storage APIs, that means that your cache, indexedDB, localStorage and cookies etc can all count towards your storage limit. These are not hard figures as the specification is still being standardised across browsers, therefore they are subject to change. I would use the rule of thumb: Don't bank on more than 20mb of space available. Think of your mobile users, your poor storage starved mobile users! 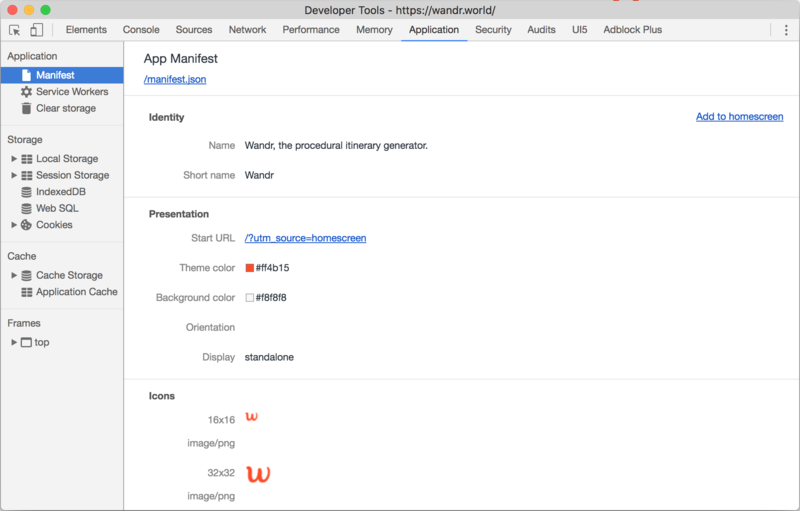 A manifest file is primarily for mobile browsers, allowing you to simulate a native-app experience for your web app. This is achieved by giving users the opportunity to 'Add to Homescreen'. This will 'install' the application on the user's device and allow them to run it from their app launcher, in a headerless browser. This gives the user a more native-feeling experience. You can examine your manifest file in Chrome Dev Tools, via the 'Application' tab and Manifest heading. You can now examine many of the individual properties in your manifest, it will even render the icon images. The icons key in your manifest file are important, especially as the manifest specification matures. These icons are used not just as the 'app launcher' tile image, but also in the splash page of the app while it loads. As Progressive Web Applications mature and become more widely supported, these shivs won't be necessary. You can read more about all the different properties you can set in your manifest at Google Developer docs. 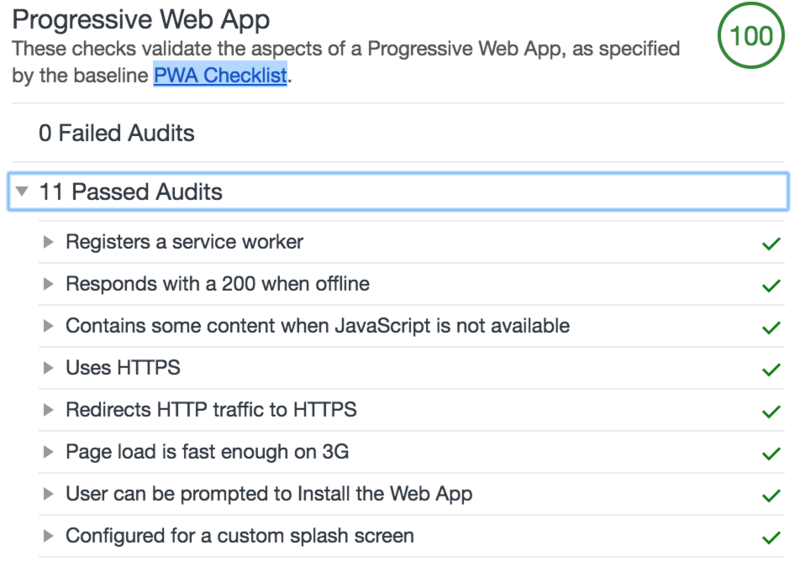 Lighthouse is an open-source audit tool for webpages, focusing on the core areas: progressive web apps (most of this comes from the PWA checklist), performance, accessibility and best practices. Lighthouse scores the webapp in each of these areas and provides human-friendly information on how to score higher and fix issues in your webapp. You can run Lighthouse directly from Chrome dev. tools on a page (open Chrome dev tools and navigate to the Audits tab), as a Chrome extension or from the commandline using the npm package. You can run Lighthouse directly from Chrome dev. tools on a page, as a Chrome extension or from the commandline using the npm package. The best part of a Lighthouse report is the feedback given for each of your scores, the feedback tells you what was done correctly and what can be approved. The highlight of this is that the information is human-friendly, not just a generic error as we so regularly find in web development. Opportunities to improve the performance of my webapp are listed in the above screenshot, with clear instructions on how this can be achieved. Using Lighthouse to audit your webapp helps you to contribute to a reach PWA ecosystem and ensures that you are building responsive, performant webapps. In cases where your webapp isn't as well-built as it could be, Lighthouse even offers insights on improving your webapp. 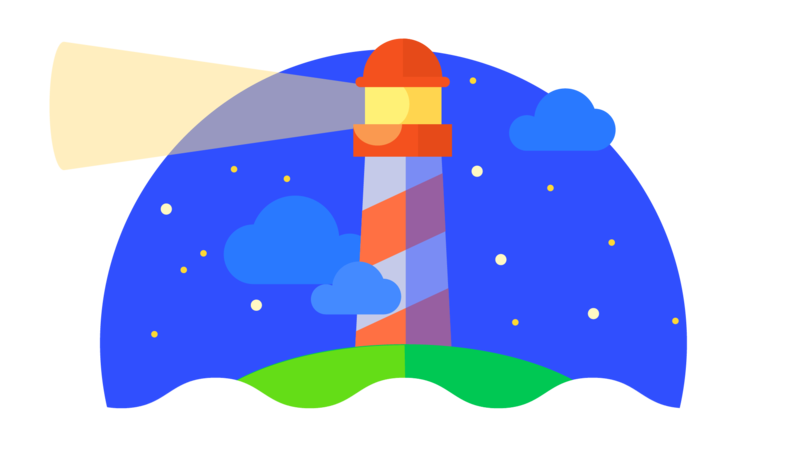 I believe that Lighthouse is an invaluable tool that will become a part of all web developers toolkits in the near future, get ahead of the curve and start using it now! You can view a large and growing list of Progressive Web Applications at https://outweb.io/ and https://pwa.rocks/, you can even index your own applications on these websites! Leave a comment or tweet me, letting me know what you've been building throughout this post! I'm a massive advocate of PWAs and can't wait for the day that the majority of websites leverage service workers and manifest files.